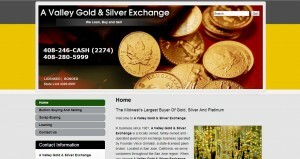 A Valley Gold & Silver Exchange address, phone, website, hours of operation, and more. A Valley Gold & Silver Exchange is a locally owned, family-owned and -operated jewelry/coin exchange business operated by Founder Vince Grimaldi, a state-licensed pawn broker. Located in San Jose, California, we serve customers throughout the San Jose region. When you choose A Valley Gold & Silver Exchange, you benefit from the wisdom, expertise and knowledge of a company that provides professional service and outstanding value to our clients. At A Valley Gold & Silver Exchange, we provide free appraisals on your valuables, and we also sell scrap gold and silver jewelry. Please continue to browse our website to learn more about our services.